Christopher and his parents share their family testimony of redemption and grace. The Yuans’ amazing story, told from the perspectives of father, mother and son, offers encouragement and hope for anyone who was or has a prodigal. Holy Sexuality and the Gospel: Homosexuality – Nature or Nurture? With his background in the health sciences, Dr. Christopher Yuan reviews the scientific studies related to etiology of sexual orientation. But more importantly, he helps to show how causation and sexuality are better understood in light of biblical anthropology. With a solid background in biblical exegesis—having studied both Hebrew and Greek—Dr. Christopher Yuan presents and analyzes the gay-affirming interpretations of Old Testament and New Testament passages on homosexuality with clarity and compassion. How can Christians better engage with our loved ones and friends in the LGB community? 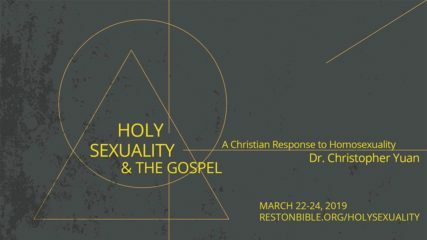 How does the gospel (sin, repentance and redemption) influence the conversation around sexual identity? Without any compromise of truth or grace, Dr. Christopher Yuan combines his life experiences and his theological training in biblical languages to bring a fresh and unique perspective on this important topic.